Drosophila cell lines are important reagents for both fundamental and biomedical research. 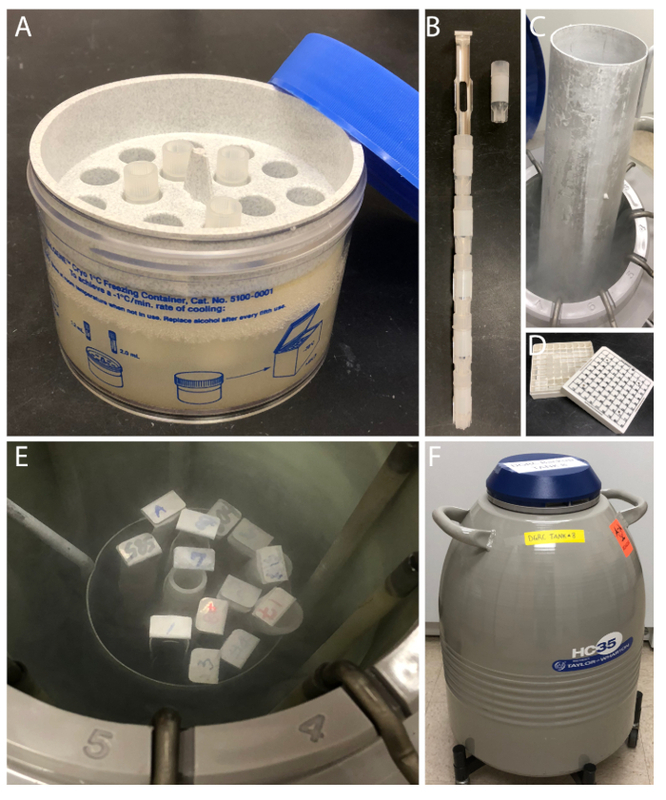 This article provides protocols for thawing, subculturing, and the cryopreservation of commonly used Drosophila cell lines to assist researchers in incorporating the use of these reagents in their research. Luhur, A., Klueg, K. M., Roberts, J., Zelhof, A. C. Thawing, Culturing, and Cryopreserving Drosophila Cell Lines. J. Vis. Exp. (146), e59459, doi:10.3791/59459 (2019). There are currently over 160 distinct Drosophila cell lines distributed by the Drosophila Genomics Resource Center (DGRC). With genome engineering, the number of novel cell lines is expected to increase. The DGRC aims to familiarize researchers with using Drosophila cell lines as an experimental tool to complement and drive their research agenda. Procedures for working with a variety of Drosophila cell lines with distinct characteristics are provided, including protocols for thawing, culturing, and cryopreserving cell lines. Importantly, this publication demonstrates the best practices required to work with Drosophila cell lines to minimize the risk of contaminations from adventitious microorganisms or from other cell lines. Researchers who become familiar with these procedures will be able to delve into the many applications that use Drosophila cultured cells including biochemistry, cell biology and functional genomics. The use of Drosophila cultured cells complements in vivo fly genetic analysis and serves as a primary inquiry tool for addressing many basic biological questions1,2,3. Drosophila cell lines offer unique homogenous populations of cells derived from different tissue sources with distinct genetic backgrounds. Cell lines are suitable for many applications including transgenic gene expression, genomics, transcriptomics, proteomics, metabolomics, high throughput RNA interference (RNAi) screens, cell biology and microscopy. Importantly, the use of Drosophila cell culture facilitates the characterization of the immediate temporal responses to known stimuli. Furthermore, Drosophila cell culture is amenable to CRISPR-Cas9 genome editing, making it relatively easy to create new cell lines with specific genome modifications4,5,6,7. The Drosophila Genomics Resource Center (DGRC) serves as a repository and distribution center for Drosophila cell lines. One of the goals of the DGRC is to assist members of the research community in using Drosophila cell culture resources. This article presents basic protocols for the handling of Drosophila cell lines. It complements existing resources to help researchers become comfortable with handling Drosophila cell cultures and achieve a level of independence in their experiments1,2,8,9,10. The most commonly used Drosophila cell lines are: Schneider lines11, Kc16712, Mitsubishi/Miyake imaginal disc and central nervous system (CNS) lines13,14, Milner laboratory imaginal disc lines15, the adult ovarian cell lines16,17, and the Ras lines18 (Table 1). The Schneider and Kc167 lines are general all-purpose cell lines for use in biochemistry, recombinant transgenic gene expression, and reverse genetic screens. The Mitsubishi/Miyake laboratory (ML) lines were derived from either the larval imaginal discs or central nervous system (CNS) and they have been useful for studies related to neurosecretion, transcription regulation, and RNA processing. The Milner (CME) disc lines have been important for studying signal transduction. The fGS/OSS cell lines derived from mutant adult ovaries remain important reagents to study the impact of non-coding small RNA biology in germ cell maintenance and differentiation17,19. Lastly, the Ras lines are unique because these are cell lines derived from embryos ectopically expressing the Ras oncogene. They have the transcriptional signature of muscle precursor cells and expresses active piRNA machinery20. Recent review articles and book chapters cover the applications of these popular cell lines with more details2,3,9. All these cell lines can be subcultured and frozen. There are slight but important different requirements for how each cell line is maintained and prepared for cryopreservation. For example, distinct cell lines require different media and supplements (Table 1). The lines also vary in surface adherence properties, morphologies (Figure 1 and Figure 2), genotype and doubling time (Table 2). We present basic protocols and highlight the unique differences for handling the various widely used Drosophila cell lines. 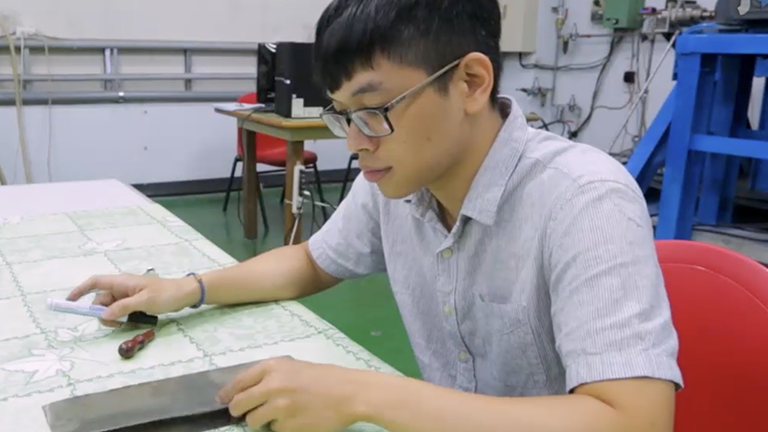 Sterilize the hood by wiping the working surface with 70% ethanol. Dispense 5 mL of the appropriate medium (Table 1) into a 25 cm2 T-flask (T-25). Remove the cryovial/ampule from liquid N2 or dry ice. Wipe the cryovial with 70% ethanol, carefully loosen and unseal the ampule. Using a Pasteur pipette, withdraw 1 mL of room temperature (RT) media from the T-25 flask. Slowly add the media into the cryovial and gently mix to thaw the frozen cells, ensuring that the cell suspension does not overflow. Transfer the entire volume of the thawed cell suspension from the ampule into the T-25 flask. Repeat to ensure the cell suspension has been completely transferred. Place the flask in a 25 °C incubator, allowing the cells to settle and adhere for at least 2 h. Examine the cells under a microscope to ensure that most cells have settled on the growing surface. Gently remove old media and replace with 5 mL of fresh media. Return the flask into the incubator. On the following day, gently remove the old media and replace with 5 mL of fresh media. Return the culture to the incubator. In a sterile hood, thaw the cells by resuspending the frozen pellet with 1 mL of RT media. Transfer all the thawed cell suspension into a 15 mL conical tube. Pellet the cells by centrifugation at 1,000 x g for 5 min. Discard the supernatant and resuspend the cell pellet in 5 mL of fresh media. Transfer the entire volume of the cell suspension into a T-25 flask and incubate the culture at 25 °C. 1 to 2 h later, examine the cells under the microscope to ensure that most cells have settled on the growing surface. On the following day, replace the old media with 5 mL of fresh media and return the culture to the incubator. Sterilize the hood by wiping with 70% ethanol. Bring the sterile materials for subculturing into the hood, including media bottles, pipettes, pipette aid, and culture plates. Examine the morphology and confluence of the culture under a microscope. Look for clear signs of microorganismal contaminations in the culture. Determine whether the cells are ready to be passaged, based on the characteristics of the culture: cell density and doubling time, including the last time they were subcultured. If the culture appears highly confluent (Figure 1), determine the cell density. In the sterile hood, dislodge the cells from the growing surface by pipetting up to 10 mL of the medium from the plate and dispensing it over the cells. Repeat a few times, ensuring not to create foam, until the growing surface becomes clear. Determine the cell density using a hemocytometer or an automatic particle counter (section 5, Figure 3). Subculture the cells if the cell density is between 5 x 106 and 1 x 107 cells/mL. NOTE: Do not subculture Drosophila cell lines to a cell density below 1 x 106 cells/mL. Dilute the cell suspension accordingly using an appropriate medium to a final seeding concentration of at least 1 x 106 cells/mL. For routine passaging and maintenance, add an appropriate volume of cell suspension to a pre-determined volume of medium in a new culture plate to achieve the desired seeding cell density. For scaling up a culture, transfer all the cell suspension into a large flask. Dilute the cell suspension to the desired cell density with an appropriate volume of the medium. Distribute equal volumes of the diluted cell suspension to new plates. This method minimizes the variations in cell density between plates. Cover and label the plates with the operator initials, date, split ratio, seeding cell density, cell line identifier, media, passage number and any media additions such as antibiotics. Place the plates into a plastic container and return the box to the incubator. NOTE: Table 3 lists the culture vessels commonly used for culturing Drosophila cell lines and the associated working volumes. Transfer all the medium from the plate to a new sterile flask. Save the medium. Rinse cells by slowly adding 1 mL of 0.05% trypsin-EDTA to the plate. Swirl gently to ensure the trypsin solution covers the entire growth surface. Discard the trypsin solution. Gently add 1 mL of 0.05% trypsin-EDTA to the plate. Incubate the plate at 25 °C between 3−10 min while monitoring for visible signs of the cell layer detaching and sliding off the growing surface. Add 9 mL of the saved medium to the plate to stop trypsin activity. Mix the cell suspension to dissociate cell clumps. Once all cells have been dislodged, the growing surface will be clear. NOTE: The use of digestive enzymes such as trypsin aids in passaging strongly adherent cell lines. Trypsin is a mixture of proteases often derived from porcine pancreas and is commercially available in different grades of purity. Prepare the hemocytometer slide and coverslip by wiping the surface with 70% alcohol. Mix the cell suspension and dispense 15 µL of the cell suspension into the grooved edge of the hemocytometer (Figure 3A) to fill the first chamber of the hemocytometer. Fill the second chamber of the hemocytometer. The cell suspension will be drawn into the counting chamber by capillary action. Using a 10x microscope objective, count the cells within the 1 mm2 area in the middle of the grid bound by the parallel lines (Figure 3C,D). To avoid duplicate counting, count the cells that overlay the top and left boundaries, but not cells that cross the right and bottom boundaries of the 200 µm2 squares. Count between 100−200 cells. Repeat the count with the second chamber. Calculate the average of the two counts and determine the cell density according to the following formula: Cell density (cells/mL) = Average cell count (n1 + n2/2) x 104. NOTE: Cell viability is expressed as the percentage of viable cells over total cells. To determine cell viability, mix the cell suspension with an equal volume of trypan blue (0.4%) solution prior to manual or automatic cell counting. Live cells will not take up the dye, while dead cells will be stained blue. Check the culture for healthy morphology, growth, and the lack of contamination. Harvest the cultures from the mid to late-log growth phase (step 3.3, or section 4). For many Drosophila cell lines, it is approximately between 4 x 106 cells/mL to 8 x 106 cells/mL. Transfer the entire cell suspension into a 15 mL or 50 mL conical tube. Collect the cells by centrifugation at 1,000 x g for 5 min and discard the supernatant. Resuspend the cell pellet in a volume of freezing medium (Table 4) that will result in a final cell density of at least 4 x 107 cells/mL. Add dropwise the appropriate amount of the cryoprotectant dimethyl sulfoxide (DMSO) into the cell suspension such that the final DMSO concentration is 10%. Gently mix the cell suspension. Carefully dispense 0.5 mL of the cell suspension into aliquots of the pre-labeled cryovials (~2 x 107 cells/vial). Place the ampules into a freezing container filled with isopropanol (Figure 4A). Transfer the freezing container into a -80 °C freezer overnight to allow the temperature of the cryovials to drop slowly (-1 °C/min) to the freezer temperature. Take out the frozen cryovials and rapidly attach them to canes (Figure 4B). Insert the canes containing cryovials into a canister (Figure 4C). Alternatively, place frozen cryovials inside a pre-cooled freezing box (Figure 4D). Store frozen cryovials in the liquid phase of N2 freezers (Figure 4E,F). NOTE: When using freezing media containing DMSO, a delay of up to 30 min at RT is not detrimental to the cells. It is important to thaw frozen Drosophila cells rapidly and culture them at a cell density that brings the culture back into the growth phase. If the procedures for cryopreservation and thawing are adhered to, the cell density in the T-25 flask will at least equal 4 x 106 cells/mL. One to two hours after thawing, most Drosophila cell lines will begin to attach to the growing surface. Under the circumstance in which most of the cells have not attached on the growing surface within two hours after thawing, it is recommended to incubate the cells overnight before changing the media. The goal of subculturing is to maintain cells in the healthy exponential log-phase of the growth curve. The criteria for subculturing depend on the visible lack of microorganismal contamination, cell density, and the need to establish a regular maintenance schedule. It is important to first assess the health of the cells and determine the absence of adventitious contaminants prior to freezing. Most bacterial and fungal contaminants are easy to detect simply by visual inspections. Contaminated cultures can be identified by an increase in media turbidity. Under the microscope, contaminants may appear as bacterial rods, cocci, budding yeast cells or string-like fungal hyphae. Other sources of contamination such as the non-cytopathic mycoplasma cannot be visually detected and can be routinely tested by PCR-based assays21. The confluence of a cell line can be determined visually (Figure 1). Fast growing cell lines reach confluence early and need to be passaged regularly. Such lines are subcultured up to twice a week. In contrast, slow growing cells are passaged at least once every two weeks or longer. However, the cells need to be fed fresh media every week. This is to prevent media exhaustion and to dilute metabolic waste products from the cells. Cell lines derived from varying tissue sources differ in their morphology (Figure 2), adherence properties, media requirements (Table 1) and doubling time (Table 2). Table 5, Table 6, Table 7, and Table 8 list the recipes for the various Drosophila cell culture media. Cell counting ensures an accurate seeding density and a predictable routine for subculturing. For quantitative experiments, cell counting is essential. Cells are counted either by using a hemocytometer (Figure 3A) or an automated particle counter (Figure 3B). If using an automated counter, follow the manufacturer's instructions. Counting cells manually using a hemocytometer is economical and easy. The number of cells enclosed in the middle Neubauer grids are counted and the cell density is calculated; For example, n = 214 cells, resulting in a cell density of 2.14 x 106 cells/mL (Figure 3D). Cell suspension from two 100 mm plates, each containing 10 mL of cell suspension at 4 x 106 cells/mL are collected and resuspended in 2 mL of freezing media to achieve a density of 4 x 107 cells/mL. Each frozen cryovial with 0.5 mL of cell suspension contains 2 x 107 cells. This will result in a culture with 4 x 106 cells/mL when thawed according to the protocol section 1. Figure 1: Representative images of three distinct Drosophila cell lines at different confluence and cell densities. (A) S2-DGRC culture at 1 x 106 cells/mL. (A') S2-DGRC culture at 4.5 x 106 cells/mL. (B) ML-BG2-c2 culture at 2 x 106 cells/mL. (B') ML-BG2-c2 culture at 8 x 106 cells/mL in which cells are piling and aggregating as foci. (C) OSS culture at 1 x 106 cells/mL. (C') OSS culture at 4 x 106 cells/mL. Cells in suspension are not captured on the same focal plane. Scale bar = 100 µm. Please click here to view a larger version of this figure. Figure 2: Representative images of the eight distinct Drosophila cell lines. (A) Round embryo-derived S2-DGRC. (B) Round embryo-derived Kc167. (C) Round larval CNS-derived ML-BG2-c2. (D) Round larval spindle-shaped ML-BG3-c2. (E) CME L1, a cell line derived from the larval leg imaginal discs, is smaller and has round/fusiform morphology. (F) OSS, a cell line derived from adult ovaries, displays spindle-shaped morphology. (G) Spindle-shaped RasV12 cell line expressing activated Ras. (H) RasV12; wtsRNAi (WRR1), a cell line expressing activated Ras and double-stranded RNA targeting the tumor suppressor warts (wts), displays epithelial characteristics. Scale bar = 50 µm. Please click here to view a larger version of this figure. 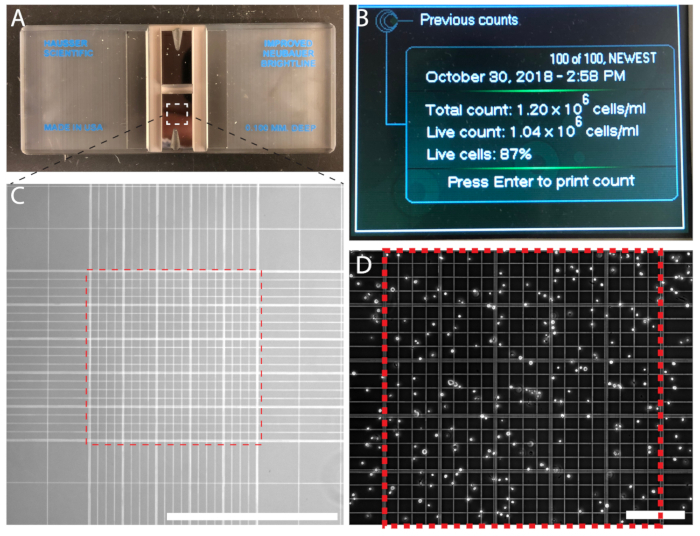 Figure 3: Cell density can be counted manually using a hemocytometer or automatically using an automated particle counter. (A) A hemocytometer with two chambers. (B) An automated cell counter displaying the output of a cell count. (C) The improved Neubauer cell counting grid viewed under a 10x objective. Count cells bound by the 0.1 mm3 central grid (red dashed-line square). (D) The central grid on the hemocytometer filled with cells for counting. Scale bar = 1 mm (C); 0.2 mm (D). Please click here to view a larger version of this figure. Figure 4: Equipment for cryopreservation. (A) A freezing container stores the ampules in an upright position for slow freezing. (B) A metal cane for holding frozen ampules. (C) A canister for holding canes. (D) A plastic freezing box (cryobox). (E) A canister holding multiple canes inserted into a liquid N2 storage tank. (F) A liquid N2 storage tank. Please click here to view a larger version of this figure. Table 1: The properties and media requirements of various Drosophila cell lines. Different isolates of semi-adherent Schneider lines including S2R+, S2-Drosophila RNAi Screening Center (DRSC), S2-Drosophila Genomics Resource Center (DGRC), and Sg4 are commonly used cell lines that proliferate robustly when cultured in M3 media + Bactopetone yeast extract (BPYE) supplemented with 10% fetal calf serum (FCS). Alternatively, Schneider's media (pH 6.7-6.8) is often used in place of M3+BPYE. The Kc lines proliferate in either M3 + BPYE (5% FCS) or serum-free CCM3 media. The ML imaginal disc and central nervous system (CNS) lines require insulin supplementation for proliferation. The Milner imaginal disc lines require both insulin and fly extract supplementation. Adherent fGS/OSS cell lines require insulin, a higher concentration of fly extract as well as glutathione for growth. Adherent RasV12 lines grow well in M3 + BPYE (10% FCS). Trypsin is used to dislodge adherent cell lines from the growth surface. Table 2: Genotype, doubling time, and tissue sources of widely used Drosophila cell lines. The tissue genotype, source and population doubling time of commonly used cell lines are presented. Doubling time is based on growth in the recommended media at 25 °C. Table 3: Culture vessels and the recommended media volumes. Culture vessels of various sizes are available for culturing Drosophila cells. The appropriate media volumes (mL) are recommended for each vessel. Seal multi-well plates containing less than 0.5 mL of cell suspension with paraffin film to reduce media loss due to evaporation. Table 4: Recipe for preparing 100 mL of freezing medium (M3 + BPYE, 20% FCS, 10% DMSO). Prepare freezing media as needed and avoid storing freezing media containing DMSO for prolonged period. Table 5: Recipe for preparing 1 L of M3 + BPYE tissue culture medium. Adjust pH to 6.6. Sterilize by passing the medium through a 0.22 µm filter. Table 6: Recipe for 1 L of fGS/OSS M3 base medium. Adjust pH to 6.8. Sterilize by passing the medium through a 0.22 µm filter. Table 7: Recipe for 1 L of Hyclone-CCM3 tissue culture medium. Adjust pH to 6.2. Sterilize by passing the medium through a 0.22 µm filter. Table 8: Recipe for preparing 100 mL of various common Drosophila cell culture media. Incubate FCS at 56 °C for 1 h and shake every five minutes to heat-inactivate complement proteins. Drosophila cell cultures are primary reagents for high throughput cell-based screens. Their use also complements in vivo genetic research by providing a homogenous population of cells suitable for biochemistry, rapid testing of transgenic constructs prior to injecting into flies, cell biology, microscopy and more recently somatic cell genetic manipulations by genome editing1,2,3,8,9,10. The viability and recovery of frozen Drosophila cells is sensitive to drastic fluctuations even at low temperatures. The DGRC stores frozen cell lines in the liquid phase of N2 (-196 °C) and transports them in dry ice (-78.5 °C). Frozen ampules that have been transported in dry ice should not be transferred back into liquid N2 or a -80 °C freezer for storage. Instead, the frozen cells should be thawed, reseeded at a high cell density as soon as possible upon arrival (protocol section 1) and cultured for their intended purposes (protocol section 3). If the cell lines are not immediately utilized for experiments, the cell lines should be cryopreserved (protocol section 6) until they are ready for use. 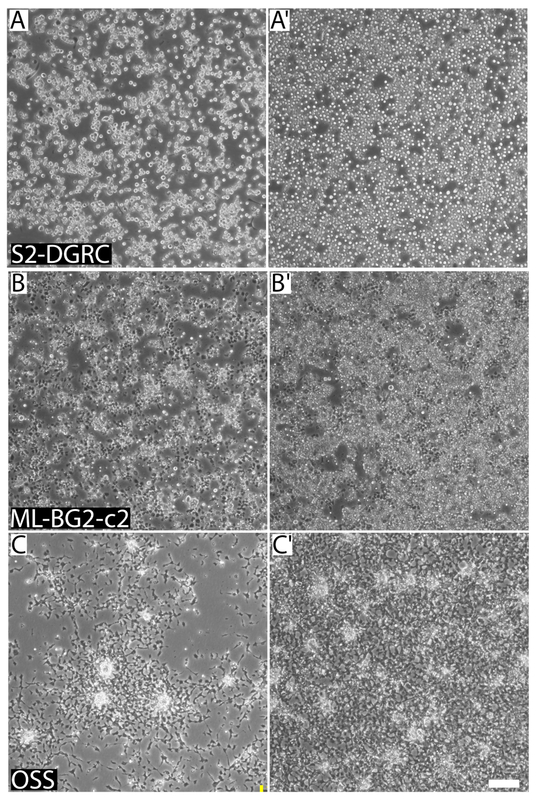 Some cell lines, such as the ML-BG2-c2 and Ras lines need several days to recover from the effects of being revived from the cryopreserved state. A significant amount of cellular debris accompanies these cell lines the first few days after thawing. Left undisturbed, the cells will recover and proliferate. Many Drosophila cell lines at the DGRC have been adapted to grow in M3 based media22. For cell lines that are slow to recover from the effects of thawing, the use of conditioned media may be useful. Conditioned media likely contain growth factors secreted by the cells into the media which may encourage the recovery and proliferation of the cells after thawing. Cell lines generally follow a stereotypical growth curve consisting of a lag phase, exponential phase, plateau phase and a deterioration phase. Many Drosophila cell lines proliferate in the log-phase of growth when they are cultured at a density between 1 x 106 and 1 x 107 cells/mL at 25 °C. It is essential that cell lines are passaged such that they are always in the exponential growth phase. The confluence of a culture, expressed as a percentage, describes the growth surface area that is covered by cells. Cell confluence for a cell line depends on its cell shape and size. Distinct cell lines have different morphologies and adherence properties. 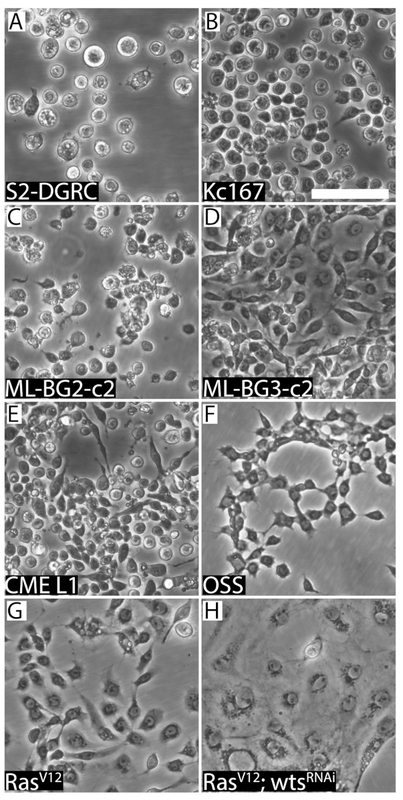 As a result, different cell lines at approximately similar confluence may have vastly distinct cell density (Figure 1). 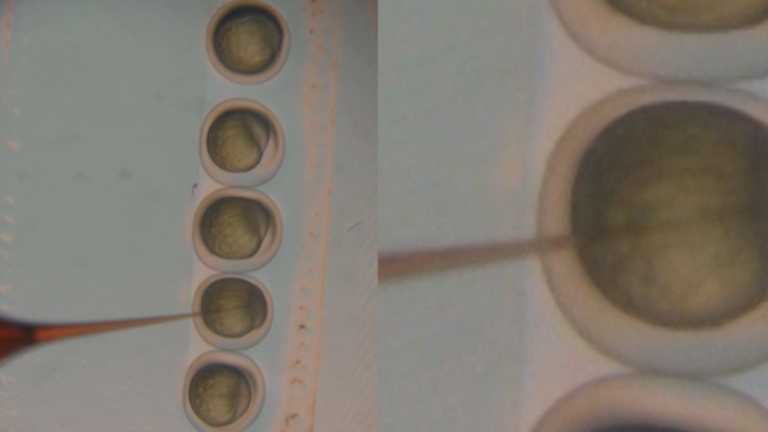 Culture confluence may not be an ideal indicator for passaging Drosophila cell cultures because Drosophila cell lines continue to proliferate either by piling on top of one another as foci or in suspension even after the growth surface has been covered (Figure 1). However, users experienced with specific cell lines may often use confluence as a rapid visual guide for when to subculture. While it is possible to grow Drosophila lines at ambient RT between 19−25 °C, it is not recommended because ambient temperature fluctuations may affect the proliferation rate. The use of a dedicated 25 °C incubator is recommended. The incubator for Drosophila cell cultures does not need to facilitate CO2 gas exchange because Drosophila cell culture media do not use CO2 for buffering. The humidity inside the incubator for culturing cell lines is an important factor not to be overlooked when culturing cells in plates. Depending on the type on incubator and the working environment, it may be necessary to place a beaker of sterile water inside the incubator. To minimize media evaporation, use closed T-flask or store culture plates in a tightly sealed plastic container while inside the incubator. It is important to develop a schedule for subculturing Drosophila cell lines. To estimate the growth rate and monitor consistency, it is convenient to subculture at an even geometric ratio (split ratio 1:2, 1:4, 1:8). For example, a 10 mL confluent plate of Kc167 cells at 8 x 106 cells/mL can be split at 1:8 ratio to achieve a seeding density of 1 x 106 cells/mL (1.25 mL of cell suspension diluted into 8.75 mL of fresh media). In 72 h, Kc167 cultures are expected to proliferate to a density of 8 x 106 cells/mL, given its doubling time of 24 h. The split ratio therefore is determined to facilitate a convenient subculture routine of up to twice a week, ensuring that the cells are always cultured in their exponential log phase of growth. This allows for a regular schedule for subculturing the cells so that the time to confluence is neither too short nor too long. If the time to confluence is too short, the cells are subcultured at a lower cell density (higher split ratio). Similarly, if the time to reach confluence is too long, the cells are subcultured at a higher cell density (lower split ratio). It is important to note that most Drosophila cell lines are very sensitive to low cell densities (<1 x 105 cells/mL), in which cells hardly proliferate and may eventually die. Drosophila cell lines vary in growth characteristics and morphology. As a result, cell lines with distinct properties may have to be handled differently. Most Drosophila cell lines are semi-adherent. At lower cell density, they adhere stronger to the growth surface and as the culture becomes confluent, the cells become less adherent and easily detach. This gradual change in cell adherence facilitates easy subculturing of most widely used Drosophila cell lines (Schneider, Kc lines, imaginal disc and CNS lines) as it allows the operator to simply dispense media over the cell monolayer to dislodge them from the growth surface when the culture is dense. For lines that are surface adherent such as the female germ-line stem/ovarian somatic sheath (fGS/OSS) and Ras lines, it is essential to incubate the cells in trypsin for a short duration to aid in detaching the cells from the growth surface. Media additions for most Drosophila cell lines include fetal calf serum (FCS). Insulin and adult fly extract (FEX) are required for some specific lines. FEX contains undefined components essential to the growth of specific larval imaginal disc lines and the adult ovarian cell lines. The DGRC prepares, and makes available adult FEX derived from 1 week old Oregon-R-modENCODE flies (RRID: BDSC_25211) in 2.5 mL and 10 mL aliquots. The DGRC also provides instructions for small scale FEX preparation on its website <https://dgrc.bio.indiana.edu/include/file/additions_to_medium.pdf>. FEX preparation, however, is time-consuming and requires a large quantity of adult flies. The cryopreservation of Drosophila cell lines saves time and reagents for the maintenance of cell lines not in immediate use. Cryopreservation is achieved by slowly freezing the cells (-1 °C/min) to -80 °C in a medium containing DMSO, a cryoprotective agent. The slow cooling step is critical for successful cryopreservation. In a -80 °C freezer, the ampule of cells is cooled at a rate of -1 °C/min when placed in a freezing container filled with isopropanol. Starting at 25 °C ambient temperature, it will take up to 2 h for the temperature in the ampules to reach -80 °C. It is recommended to leave the ampules to freeze overnight. Frozen ampules must then be rapidly transferred into the liquid phase of nitrogen for prolonged storage. At ambient temperature, the cryovial will reheat rapidly at approximately 10 °C/min and the viability will be compromised at above -50 °C23. To keep the transfer rapid, handle ampules in small batches to minimize the exposure to ambient temperature. Alternatively, place the frozen cryovials on dry ice while preparing for their transfer into liquid N2. If liquid nitrogen is not available, the cells may be stored in a -80 °C freezer, although with a risk of significant deterioration over time. Cell density is critical for successful cryopreservation and the subsequent revival of cell lines. In general, new cell lines should be frozen to create the initial freeze (1−3 ampules) as soon as an excess of cells becomes available. Once the cell line has been further cultured stably, a frozen stock of 10−20 ampules should be created. This stock is then thawed to check for its post-freeze cell recovery and viability, after which it is propagated for experimentations or to replace the stock when the number of frozen stock ampules falls below five. Finally, it is important to validate that the thawed cells retain the characteristics of its parental stock as cell lines are known to evolve3,24. In conclusion, this article presents a primer for working with Drosophila cell cultures by providing the fundamental information on the various lines, best practices, and audiovisual protocols for the basic handling of Drosophila cell lines. This accessible resource is meant to smoothly ease the introduction to working with cultured Drosophila cells and to complement existing training guides at any research laboratory. We thank the National Institutes of Health (Award NIH P40OD010949) and the research community for utilizing the various D. melanogaster DNA/vector/cell resources curated at the DGRC. Baum, B., Cherbas, L. Drosophila: Methods and Protocols. Methods in Molecular Biology. Dahmann, C. 420, Humana Press. Ch. 25 391-424 (2008). Cherbas, L., Gong, L. Cell lines. Methods. 68, (1), 74-81 (2014). Luhur, A., Klueg, K. M., Zelhof, A. C. Generating and working with Drosophila cell cultures: Current challenges and opportunities. Wiley Interdisciplinary Reviews: Developmental Biology. e339 (2018). Franz, A., Brunner, E., Basler, K. Generation of genome-modified Drosophila cell lines using SwAP. Fly (Austin). 11, (4), 303-311 (2017). Housden, B. E., et al. Identification of potential drug targets for tuberous sclerosis complex by synthetic screens combining CRISPR-based knockouts with RNAi. Science Signaling. 8, (393), r9 (2015). Kunzelmann, S., Bottcher, R., Schmidts, I., Forstemann, K. A Comprehensive Toolbox for Genome Editing in Cultured Drosophila melanogaster Cells. G3 (Bethesda). 6, (6), 1777-1785 (2016). Ishizu, H., Sumiyoshi, T., Siomi, M. C. Use of the CRISPR-Cas9 system for genome editing in cultured Drosophila ovarian somatic cells. Methods. 126, 186-192 (2017). Echalier, G. Drosophila Cells in Culture. Academic Press. (1997). Echalier, G., Perrimon, N., Mohr, S. Drosophila cells in culture. 2nd edition. Elsevier. (2017). Cherbas, L., Cherbas, P. Drosophila: A practical approach. Roberts, D. B. 10, 2nd, Oxford University Press. 319-346 (1998). Schneider, I. Cell lines derived from late embryonic stages of Drosophila melanogaster. Journal of Embryollgy and Experimental Morphology. 27, (2), 353-365 (1972). Echalier, G., Ohanessian, A. Isolement, en cultures in vitro, de lignees cellulaires diploides de Drosophila melanogaster. Comptes rendus de l'Académie des Sciences. 268, 1771-1773 (1969). Ui, K., et al. Newly established cell lines from Drosophila larval CNS express neural specific characteristics. In Vitro Cellular & Developmental Biology − Animal. 30A, (4), 209-216 (1994). Ui, K., Ueda, R., Miyake, T. Cell lines from imaginal discs of Drosophila melanogaster. In Vitro Cellular & Developmental Biology. 23, (10), 707-711 (1987). Currie, D. A., Milner, M. J., Evans, C. W. The growth and differentiation in vitro of leg and wing imaginal disc cells from Drosophila melanogaster. Development. 102, 805-814 (1988). Niki, Y., Yamaguchi, T., Mahowald, A. P. Establishment of stable cell lines of Drosophila germ-line stem cells. Proceedings of the National Academy of Sciences of the United States of America. 103, (44), 16325-16330 (2006). Saito, K., et al. A regulatory circuit for piwi by the large Maf gene traffic jam in Drosophila. Nature. 461, (7268), 1296-1299 (2009). Simcox, A., et al. Efficient genetic method for establishing Drosophila cell lines unlocks the potential to create lines of specific genotypes. PLoS Genetics. 4, (8), e1000142 (2008). Sumiyoshi, T., et al. Loss of l(3)mbt leads to acquisition of the ping-pong cycle in Drosophila ovarian somatic cells. Genes & Development. 30, (14), 1617-1622 (2016). Dequeant, M. L., et al. Discovery of progenitor cell signatures by time-series synexpression analysis during Drosophila embryonic cell immortalization. Proceedings of the National Academy of Sciences of the United States of America. 112, (42), 12974-12979 (2015). Young, L., Sung, J., Stacey, G., Masters, J. R. Detection of Mycoplasma in cell cultures. Nature Protocols. 5, (5), 929-934 (2010). Shields, G., Sang, J. H. Improved medium for culture of Drosophila embryonic cells. Drosophila Information Service. 52, 161 (1977). Freshney, R. I., Capes-Davis, A., Gregory, C., Przyborski, S. Culture of animal cells : a manual of basic technique and specialized applications. Seventh edition. edn. Wiley Blackwell. (2016). Lee, H., et al. DNA copy number evolution in Drosophila cell lines. Genome Biology. 15, (8), R70 (2014).